Skydiving is an awesome sport. Not only is it an incredible once-in-a-lifetime experience, it’s grown as a hobby throughout the US in recent years and only last month, our greatest American athletes competed in the world’s biggest national skydiving competition! If you’re thinking about trying skydiving for the first time, there are a few things you need to know first. Check out our guide here, or take a look at our FAQs for more information. What age do I have to be to skydive? The age for skydiving here in the US is 18. That means you must be at least 18 years of age if you want to skydive. We do have people ask us if a someone younger than that can jump with the consent of their guardian, but unfortunately, the answer is no. If you want to jump, you’ve got to be over 18 – but if you are younger than that and excited to give it a try, why not pitch it as an 18th birthday present idea?! In terms of maximum age to jump, there really isn’t one. As long as you’re fit and healthy, you can jump at any age. In fact, the oldest skydiver was 101 years old! What weight restrictions are there in skydiving? The equipment we use in skydiving has evolved so much over the years. Gone are the days of old-fashioned round parachutes; today, we jump proper ‘wings’ which allow us total control over where we land and how fast we get down. In order for our equipment to perform as it should, we do have weight limits. This just means that the amount of weight being carried by our parachutes and the strain being put on the harnesses is within the regulations set by the manufacturers. There are therefore weight limits for solo and tandem skydivers. The weight limit here at Skydive Monroe is 225lbs for men and 170lbs for women. We have to be strict on this for safety reasons. This includes the weight of the clothing and shoes you’ll be wearing on the jump. Exceptions can be made for the women’s category of 170lbs based on fitness levels. If in doubt, it is recommended to visit the skydive center prior to your jump to receive an assessment. What do I need to wear to skydive? 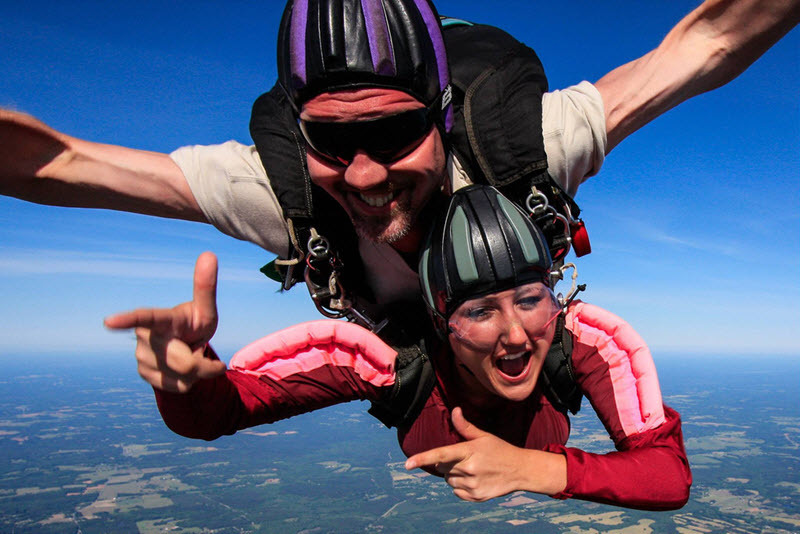 Your choice of clothing will have an effect on how comfortable you are during your skydive. It’s important you wear the right thing so you get the most out of your jump. As a rule of thumb, if you’d wear it to the gym or out running, it’s good for skydiving, too. If you’re someone who likes to dress up for a day out, feel free – but do bring along a change of clothes to wear during your jump. That means loose and comfortable trousers and tops, and sneakers or tennis shoes. You should also consider the temperature for your skydive. If it’s cold on the ground, it’s even colder in the air, so bring layers. If it’s nice and warm, you’re welcome to wear something cooler, like a t-shirt. Is skydiving right for me? So we’ve addressed the practicalities of skydiving. But before you decide to jump, you might be asking… is skydiving right for me? Of course, what we should say here is that we absolutely love to jump, so our opinion is a little biased! In all seriousness though, we welcome people from all across the States, from different backgrounds, of different ages, the majority of whom love their experience and many of whom return to try it again! If you’re looking to do something out of the ordinary that pushes your senses and thrills you, skydiving is for you. It’s an adrenaline rush unlike anything you’ve felt before. The freedom you’ll feel as you fall through the air is addictive. The empowerment it gives you, knowing you’ve faced your fears is incredible. If you’ve got any concerns about jumping or special circumstances you’d like to discuss, feel free to get in touch and a member of our team will be happy to help. To book your skydive today, visit our bookings page. We hope to welcome you to the skies soon!